It’s hard to define equal pay when employers can claim the man has a higher skill set, or more experience in the field. “We need to close those loopholes, and that is going to require a change in terminology and a change in thinking,” said David von Schlichten, assistant professor of religious studies. von Schlichten is also a coordinator of the women and gender studies program. He is the faculty advisor of the Feminist Collective Club at SHU and speaks on many different issues regarding pay inequity. Talk of the terms surrounding the Fair Pay Act was brought to light after Patricia Arquette conveyed pay inequality in her acceptance speech at the Oscars. Gov. Jerry Brown signed the act into law on Oct. 6. Lawrence found out, as a result of leaked emails from SONY, that she had received 7% of the profit, while her male co-stars received 9% (according to an article written for the LA Times). Her essay, along with Arquette’s speech, has created talk in Hollywood surrounding the Fair Pay Act and pay inequality in general across the country. “I think that this is very important because there is such a spotlight on Hollywood that if change happens there, it could help bring change nationwide,” said Danielle Giroux, junior major in business and art administration. She is also the president of the Feminist Collective Club at Seton Hill. “It can be difficult to relate to multi-million dollar salaries in Hollywood, but the basic issues of inequality are the same for all of us,” said Laura Patterson, professor of English and director of undergraduate writing programs. The pay inequality between Lawrence and her male co-stars is similar to the difference between women in middle-class work positions. Being aware of equal pay issues is important for students at SHU who will eventually be seeking careers in which unequal pay exists. “During this week, the Feminist Collective Club sponsors rallies and panels that bring awareness to these issues,” said Susan Eichenberger, associate professor of sociology and STAR coordinator. 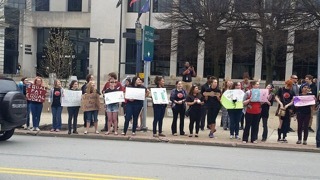 Students gathered in downtown Greensburg participating in last year’s equal pay rally. Photo courtesy of Emily Savoie. According to a report written by the American Association of University Women (AAUW) “The Simple Truth about the Gender Pay Gap”, the segregation of work between men and women is a major factor in the the pay gap. It should be mentioned that the pay gap between women and men has greatly decreased over the decades. However, while the country continues to make progress, the fact is that pay is not equal. “We wouldn’t reach parity (equality) for many, many years at the rate we are going,” Eichenberger said. 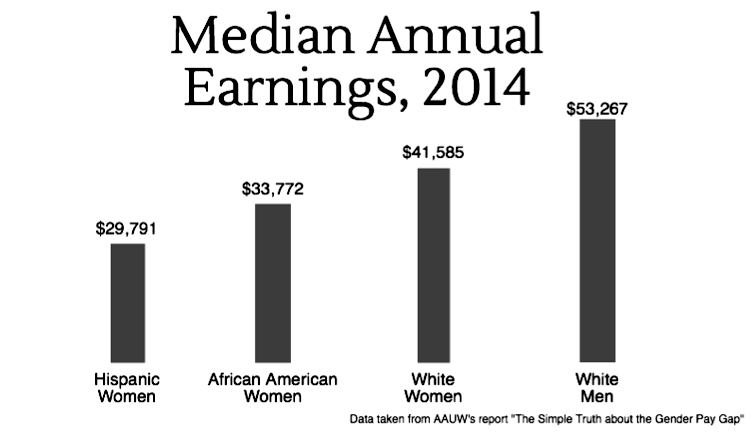 According to a chart found in the AAUW report, since 1974, the pay gap has narrowed from 59% to 79%. In a quick facts tweet mentioned in the same report, at the current rate the gap is closing, it wouldn’t officially close for 100 years.